Craig (Try, Try, Try, 2016, etc.) offers a beginner’s science book, illustrated by Tan (Listening with My Heart, 2017, etc. ), which tells of peculiar characters studying Earth’s life-forms. The otherworldly titular scientists are brightly colored creatures, vaguely round or pear-shaped, with a variety of eye quantities and forms (including eye-stalks) and even antennae. Tan delightfully and humorously depicts them in an opening spread showing the book’s pond setting. When the text begins, it’s in two sections: a beautifully designed, rhyming text box offers accessible scientific information, and separate dialogue between the scientists tells of their mission to “save Taddy Tadpole.” They’re there to observe Taddy and its siblings and to make sure that Taddy survives to adulthood. A few sections, such as one that focuses on the tadpoles’ predators, may make young readers concerned for both the amphibians and scientists, and the frog-growth timeline is quite condensed. Still, Craig packs a lot of information into a small amount of text. Tan’s illustrations mix realism with anthropomorphism; all the pond residents are accurately labeled, with the exception of an axolotl labeled as a salamander. Endnotes offer more in-depth scientific discussion. 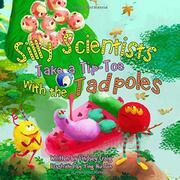 Reluctant young scientists are sure to enjoy this fanciful introduction to pond life. SILLY SCIENTISTS TAKE A PEEKY AT THE SOLAR SYSTEM!